While Audi still hasn’t spoken of a possible replacement for its iconic supercar, it’s nevertheless giving it a bunch of updates for 2019. The most notable change is on the outside, as the R8 gets a new fascia and rocker panels. Oddly enough, Audi has not supplied us with images of the car’s rear end. However, these changes do a fantastic job at giving the R8 a mean, sinister and aggressive demeanour, putting it in a similar supercar league as its cousin, the Lamborghini Huracán. New 19-inch wheels complete the package as standard. A new, optional 20-inch wheel design Audi calls “five-V” will also count among the changes. Mechanically, Audi speaks of an ECU calibration for the naturally aspirated V10, which should see a bump in horsepower and torque. The carmaker has however not yet released official numbers. 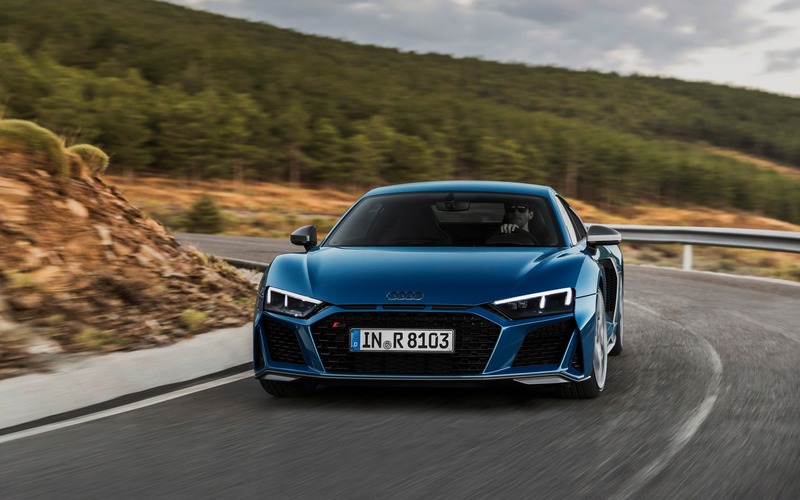 As we’re writing this, the Audi R8 pumps out 532 horsepower and the R8 V10 plus cranks out 602 ponies. The car’s dry-sump lubrication system was also modified to withstand up to 1.5 lateral Gs. Suspension and brakes, as well as Audi’s quattro all-wheel drive system, all receive tweaks too. The car gets new sensors that do a better job of managing wet and snowy surfaces. The steering also gets a rework for improved feel—always a good thing. Thanks to a revamped ESC system, Audi claims its R8 can brake from 100 to 0 km/h within a distance shortened by 5 feet (1.5 m). Finally, a weight reduction treatment was applied using lightweight materials such as aluminum and carbon fibre. To put things into perspective, the front sway bar alone now weighs 4.4 lbs. (2 kg) less than the previous one. So expect the entire car to be significantly lighter than its predecessor. These updates both affect the R8 coupe and Spyder, which will both hit Europe in early 2019 and available for pre-order now.